Google Wallet makes mobile payments a reality. Years ago, when I was working in mobile marketing, mobile payments were all the rage. Brands were just starting to experiment with SMS, and premium SMS messaging offered content creators an opportunity to monetize their mobile campaigns. If someone with a text-messaging enabled mobile device saw your call to action, “Text WAYNE to 12345 to get Lil’ Wayne’s newest single!”), they could type in the keyword, send it to a short code and Voila! they were listening to Weezy right from their mobile phone. Of course, it didn’t always work that smoothly or all the time. If you had Verizon phone, for example, which restricted hyperlinks, good luck trying to click through to the URL provided on the link you received. Or if you hit your monthly messaging limit, you wouldn’t be able to send or receive text messages at all. And at the time, mobile payments were restricted to paying for premium mobile content on your wireless carrier bill. In order to complete a purchase, there was a double opt-in process, where the user had to validate that they wanted the content and understood the costs and conditions associated with the offer. Typically, taking advantage of these premium offers involved giving your wireless carrier AND the aggregator AND (in some instances) the content platform provider a portion of the fees associated with that purchase. Subscription chat lines and information services, like KGBKGB, sprung up to tap into users’ voracious appetite for texting. You couldn’t buy tangible things with your mobile device. Outside of wallpapers, ringtones and music downloads, mobile content was the only thing you could really purchase. Today, that’s no longer the case. Smartphones, mobile web sites, and mobile apps let you use your mobile phone to purchase virtually anything. You’re no longer tethered to your wireless carrier if you want buy something. iTunes and the proliferation of copycat app stores mean that you can cop plenty of compelling content right to your device. And not have AT&T or Verizon Wireless mucking about in the transaction. But there’s a different mobile payments space growing and maturing. We’ve seen early glimpses of that with PayPal. Apps like Square that have turned your mobile phone into a payment processing center. In Europe and Asia, paying using your mobile device is commonplace. But here in the states, the growth of mobile payments has advanced at a snail’s pace. Google Wallet is a mobile payment system that allows its users to store their debit cards, credit cards, loyalty cards, and gift cards on their mobile phones. Using near-field communication (NFC), Google Wallet lets users make secure payments by simply tapping their phone on any PayPass-enabled terminal at checkout. Although Google Wallet launched in 2011, it was only this August, that they set up expanded support to all major credit and debit cards including Visa, MasterCard, American Express, and Discover. Well for one, you’re no longer reduced to making mobile payments solely with PayPal. More importantly, the tedious process of entering your payment information, name, address, credit card number, expiration date, security code, etc., is as simple as providing your username and password. This is a real boon for online retailers, who see the majority of their drop offs occurring at checkout. The best thing about Google Wallet, unlike PayPal (the carriers) and virtually any other merchant processing system, is that they don’t charge processing fees. Mind you, I’m not a Google person myself. Google Wallet doesn’t work on iOS devices. So unless there’s an app in the works, hundreds of millions of Apple users will be in the dark. At least as it relates to mobile payments. Enough with the Acronyms! Plain English please. Enough with the jargon. 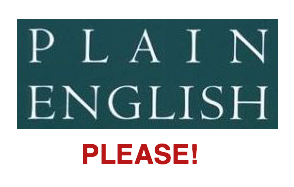 Plain English please! We had been talking about servers, storage and protocols for preserving and backing up data – not roach spray. And RAID had been introduced because it would continue to function even if one of the drives were damaged or inoperable. It’s a form of storage technology that combines several drives into a single unit, making it robust and reliable (and relatively inexpensive as servers go). Reflecting on that meeting, I was struck by the frequency with which we tech types use acronyms as if they were common parlance. The reality is that there is so much alphabet soup out there, that it’s difficult for techies to keep up, much less lay folk. So today’s class will focus on defining some of these acronyms, and building your technical lexicon. I’m sure you’re familiar with SMS (short messaging service), MMS (multimedia messaging service), DRM (digital rights management), CPM (cost per thousand impressions), yada yada. Here are four terms you may not know, but should. LBS – location based services. Tech speak: LBS is an information or entertainment service, accessible with mobile devices through a mobile network which uses information on the geographical position of the device. We are the Borg. You will be assimilated. The Borg can use LBS to find you. Plain English: LBS is a system which lets you send and receive information from your mobile phone, based on where you happen to be at the moment. Common uses of LBS include finding the nearest ATM machine (BoA), tracking a package (Fedex) or locating a specific destination (Google Maps). NFC – near field communication. Tech speak: NFC is a set of standards for smartphones and similar devices to establish radio communication with each other by touching them together or bringing them into close proximity. Plain English: NFC is technology that makes life easier and more convenient for people by allow them to make transactions, exchange digital content, and connect to electronic devices with a touch. Common uses of NFC include opening a car with your phone (ZipCar) or exchanging contact information (Bump). Tech speak: API is a source code-based specification intended to be used as an interface by software components to communicate with each other. Plain English: An API is a way of putting data into and getting data out of a system, without having to manually type that data in yourself. APIs are simple tools developers create to help other developers make the most effective and efficient use of their code. Many mobile apps out today employ APIs which let you register or log in using your Facebook or Twitter credentials. Tech speak: GUI is a type of user interface that allows users to interact with electronic devices with images rather than text commands. Plain English: A GUI makes it easier for people to learn, use and implement, through the use of icons, graphics, and menus. Think Apple. So the next time you hear a techie waxing eloquently in technical jargon, you no longer have to nod your head knowingly (while totally ignorant to what’s actually being said). You can jump in that convo and throw a few around your damn self!